Factory X has a long-held commitment to upholding safe and fair conditions for workers in its global supply chain. The current ethical sourcing policy was developed in 2008 by an external consultant. it provides a framework for communicating our ethical standards to our manufacturers. using the ethical trading initiative base code as a guide, it references both local laws, the International Labour Organisation (ILO) conventions and principles of the United Nations Universal Declaration of Human Rights. 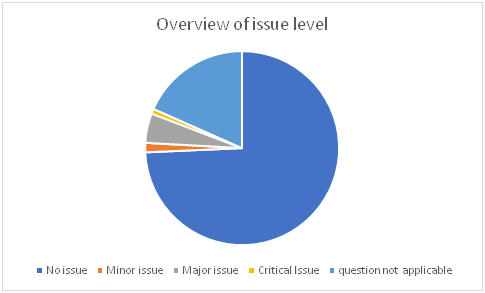 All factories are required to complete a self-assessment annually; this includes the development of a Corrective Action Plan with timeframes for addressing issues. We also expect our suppliers to provide details of their outsourcing arrangements and ensure that they provide our ethical sourcing policies to all suppliers in the Factory X supply chain. Factory X has an in-house bi-lingual team who conduct audits on a regular basis. Any corrective actions are addressed with the local manufacturer and a plan of action is agreed. A randomly scheduled audit follows to ensure that the corrective action takes place. Random audits to ensure the accuracy of internal audits are also conducted by qualified and experienced third-party certification body. 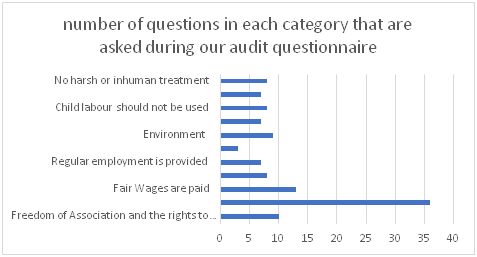 The audit process includes 117 questions. The auditors speak to both management and employees. Click here to find out more about the information gathered through our audit process. Factory X produces its range in 49 first tier factories. We have also traced 18 factories in our second-tier supply chain. One factory in our 2nd tier supply chain was audited in 2018. 51% of our first-tier factories have undergone either a 3rd party audit by Qualspec or an audit by a trained Factory X auditor. 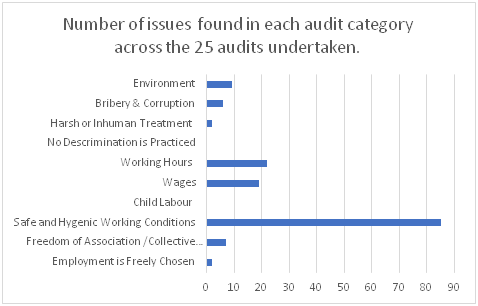 This table below provides an overview of the number of questions in each audit category in our audit questionnaire. The issues identified pertaining to environment, bribery and corruption, harsh and inhuman treatment, safe and hygienic working conditions, freedom of association and freely chosen employment were resolved within the specified timeframe. We are still working with factories to resolve some issues related to working hours and wages. Factory X is committed to maintaining, long-term relationships with our manufacturers. The table below provides information about the length of time we have been working with our factories. 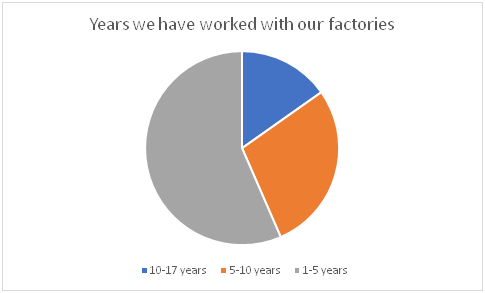 In 2018, Factory X used 49 first tier factories and we traced 14 second tier suppliers. 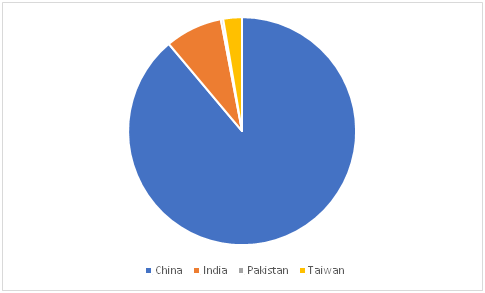 With the exception of socks (Taiwan), and leather goods (Pakistan) all our products are made in China (5 regions) & India (2 regions). A list of our factories is available here. The Pie Chart below shows the proportion of products made in each country.